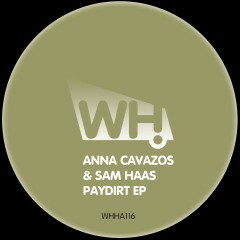 Anna Cavazos is a DJ/Producer/Singer living between LA & Berlin. Her love affair with house music started in 1998 where she began spinning records in the clubs of New York. After years of being a featured vocalist/songwriter on the tracks of Sandy Rivera, Bah Samba, Alexi Delano and more, she began producing her own music which has been signed to King Street Sounds, MUAK and Madhouse to name a few. Sam Haas is based in San Francisco and the skilled producer has created some quality music for labels like I Records, Different Attitudes, Something Different Records and MEME in the past. They now team up to bring us their excellent Paydirt EP consisting of three cuts destined to do damage on the underground dance floors.